rec. 29-31 January and 18-20 September 2013, St Mary’s Episcopal Cathedral, Edinburgh. This release has quietly become something of a Hi-Fi hot potato around MWI, and I am writing this review after more than usual reference to second opinions and a raft of varying sound reproduction equipment. It was partially at my request that it became a disc brought out for a special listening session at the MusicWeb listening studio. 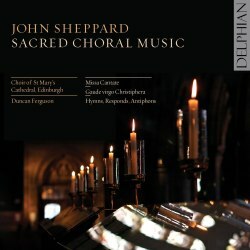 The recording was described as ‘outstanding’ by John Quinn in his earlier review, and I was initially keen to find out if I would prefer it to the St John’s College Chandos release I listened to earlier in the year (see review). Intriguingly, while vibrato is also an important factor with the Choir of St. Mary’s Cathedral, I find this for some reason a more honest expressive vehicle than with St John’s. There is a certain sameness to the dynamic throughout however – loud, loud, LOUDER – which I am going to put down to the qualities in the recording. I do much of my reviewing through Grado SR325i headphones plugged into a Marantz SA 7001 CD/SACD player. This is all part of avoiding domestic strife, but also means taking each recording from a level playing field when it comes to comparisons. Opinions may be divided on different types of equipment, and I appreciate the differences between monitoring on good quality speakers compared with headphones, but there you have it. The reason I am ploughing on with the recording aspect of this release is that it is the main reason I can’t listen to it with any kind of enjoyment. I’ve spent some time listening to this through my usual speaker system, which is admittedly more forgiving than the Grado cans, but even at low nocturnal volumes there is a feverish quality to this recording which is anything but easy to listen to. I don’t quite know why this should be the case, but at points where most or all of the choir is singing the sound seems saturated almost or even beyond the point of some kind of limiter. Just take the sublime opening piece Libera nos, salve nos as an example. When all of the voices, especially the trebles kick in you can feel the sound turning in on itself, with some kind of fight going on between something deep in the mixing desk struggling to prevent distortion and someone on the outside pushing the levels too high. There are some side-effects to this which also pop out in rather an odd way, such as the reverberation sound at 3:15 into track two, Regis Tharsis et insulae. At this moment the reverb pings out as loud as the voices like the released springs on a mattress, which ain’t right. There seems no earthly reason for all of this and it is a huge shame, since the singing of the Choir of St Mary’s Cathedral, Edinburgh is indeed magnificent. These are very good performances, and I enjoy the gutsy nature of the singing, making Sheppard into something grand and impressive rather than precious and jewel-like. We are used to superb quality from the Delphian label and I hope they can have another look at this and make something a bit less discomforting out of it.